Home / Stock Picks / Hot Stocks / Is It Finally Time to Buy Under Armour Inc Stock? Is It Finally Time to Buy Under Armour Inc Stock? After a fairy-tale run for several years, Under Armour Inc (NYSE:UA, NYSE:UAA) finally got its bell rung. After the Under Armour stock price fell almost 40% from its highs in 2016, investors thought the worst might finally be over. But 2017 didn’t disappoint the bears, crushing Under Armour stock a further 60%. In all, the stock crumbled more than 75% over the past 20 months. Since bottoming out near $10.50 though, UA stock has been on the mend, while CEO Kevin Plank seems refocused on the tasks at hand. Despite the roughly 40% rally from recent lows, should investors buy Under Armour stock? Get Ready, Get Set, No! 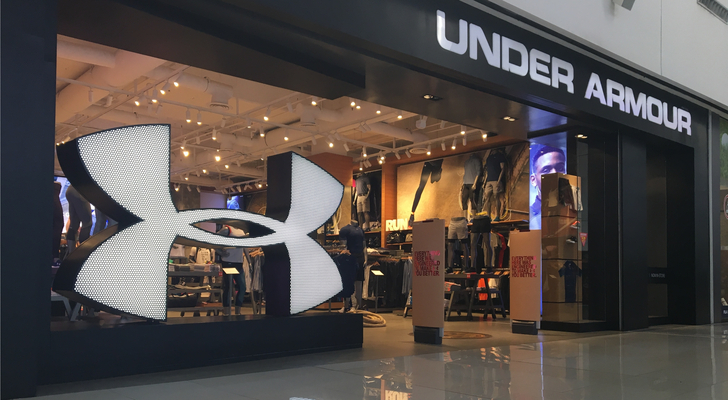 I’m not a buyer of Under Armour, and there’s a simple reason why: the changes in retail. The retail sector has undergone massive changes, decimating stocks like Kohl’s Corporation (NYSE:KSS), J C Penney Company Inc (NYSE:JCP) and Macy’s Inc (NYSE:M). Further, Amazon.com, Inc. (NASDAQ:AMZN) has taken away a lot of market share. How does this impact the Under Armour stock price? Amazon’s continuing dominance in e-commerce and Prime membership creates a bustling ecosystem. Where we once went to underarmour.com, many likely just to go to Amazon and check what’s on the site first. Nike Inc (NYSE:NKE) was facing the same issue. However, the company is actually working on a pilot program with Amazon. Admittedly, we haven’t heard too much about this relationship. During its recent conference call, Nike management said things were going well and were looking promising, but they wouldn’t elaborate much. Under Armour has partnered with Kohl’s. And while that’s far from the worst retailer to go with, I don’t know that it’s as good of a strategy as Nike-Amazon. Adidas AG (ADR) (OTCMKTS:ADDYY) has been been making up massive ground over the past year. Its products are trendy and in demand. The once super-grip Nike held over the market has been cracked by Adidas. Will it be temporary, or is the change for real? We won’t know, but recent signs are pointing to Nike solidifying its hold. But here’s how I see it. Adidas was taking market share from Nike. Nike is now taking market share back from Adidas. But where is Under Armour in all this? Consumers are speaking, and I think they’ll stick with the king in Nike or the trendiness of Adidas. UA is a distant third. 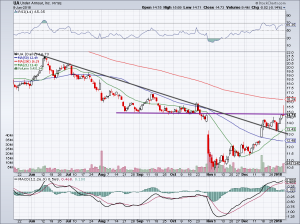 The 200-day moving average is likely to act as resistance for Under Armour stock. But its fumble on the $15 price level is a big gaff to pay attention to. After a monster breakout over this level, UA stock gave up all its gains and more on Jan. 5. What looked like a powerful bull move disappeared into thin air. Now it’s up to bulls to get back above $15, a long-time level of support, or risk turning over the stock to the bears. Getting over its down-trend line (black) was an important development. But $15 is important as well. Over this level, short-term trades can be taken on the long side. 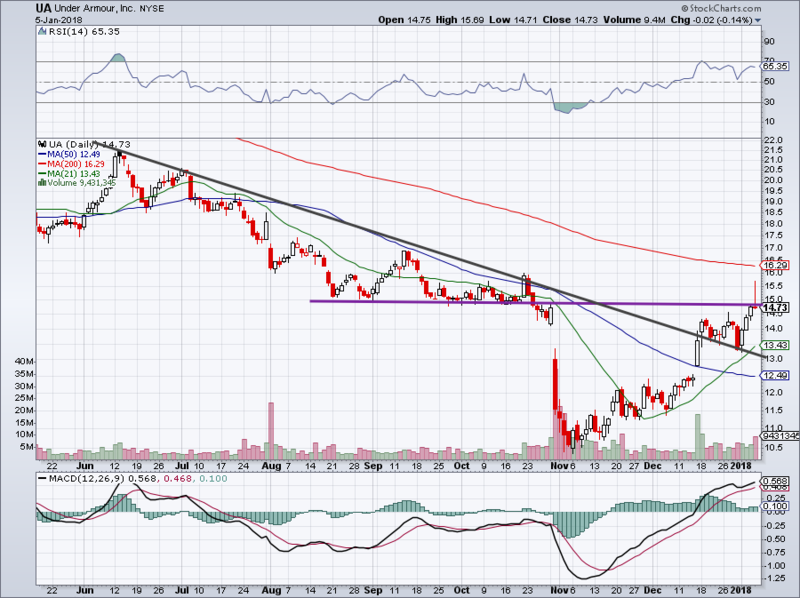 Below, wait for a pullback to the 21-day moving average or see if it finds support from the prior downtrend line. With the massive beatdown in the Under Armour stock price, one might think the valuation is quite attractive. That would be a mistake, however. Not only are shares not cheap, UA stock is actually quite expensive. Under Armour trades with a price-to-earnings (P/E) ratio of 45 and a forward P/E ratio of 46. Earnings are forecast to fall almost 70% from 2016 to 2017, which isn’t a pretty sign. Sales are forecast to grow just 2.3% this year as well. On the plus side, analysts expect earnings to grow about 70% in 2018, alongside 11% revenue growth. Even if Under Armour is able to achieve this, the 32 cents per share in earnings for 2018 is still 45% below its 2016 results of 58 cents per share. A return to double-digit sales growth and almost 70% earnings growth (if it comes to fruition) is worthy of a stock rally. But it’s far from the prior glory days, and while it makes Under Armour stock more attractive, I have trouble paying this high of a premium for a company so lacking in consistency. That’s why I prefer Nike. Aside from being far more consistent and the clear leader in the sportswear category, NKE has better growth and a lower valuation. Further, it’s a future blue-chip stock based on its previous growth and current dividend payout. Article printed from InvestorPlace Media, https://investorplace.com/2018/01/is-it-finally-time-to-buy-under-armour-stock/.